The Big East announced their all conference teams and three Georgetown student-athletes received honors. Junior Marcus Derrickson’s career season earned him a spot on the All Big East second team. Derrickson averaged career highs in points and rebounds. He ranked in the top ten in the conference in scoring, rebounds and 3-point field goal percentage. Jamorko Pickett and Jahvon Blair earned Big East All-Freshman team honors. Pickett was a unanimous selection. He finished third on the team in scoring average at 9.8 ppg, scoring double digits in 8 out of the last 11 Big East games. 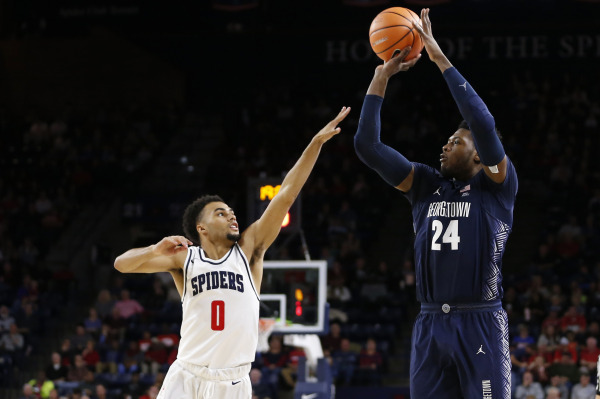 As the season went on, Pickett received praise from Coach Patrick Ewing for expanding his game beyond just being a spot up three point shooter. Jahvon Blair was one on the biggest threats off of Georgetown’s pick and roll action. The freshman guard got adept to pulling up for the jumper when teams tried to cheat over to Derrickson or Jessie Govan. He scored a career high 21 at Creighton.